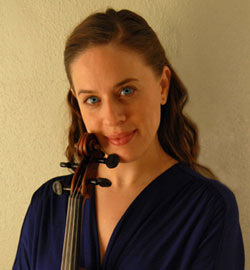 Amy Lovinger O'Brien, native of NY, holds two degrees in violin performance: a Bachelor’s degree from the Eastman School of Music and a Master’s from Kent State University. She has studied extensively with several master teachers such as Ilya Kaler, Zvi Zeitlin, Isaac Malkin, and Oleh Krysa. She has also worked under the direction of many world-renowned string quartets, such as the Ying, Miro, Miami, Juilliard, Penderecki, and Alexander Quartets. Early in her career, Amy was a member of the Hyperion Quartet, during which time the quartet won the Russell Award at the 2002 National Coleman Chamber Ensemble Competition. They performed concerts throughout the US and Canada and played a major role in bringing educational outreach presentations to the young people of Rochester, NY and surrounding areas. Amy has attended music festivals in Canada, England, and throughout the USA. After graduating in 2004, she won a position with the Orquestra Classica da Madeira in Portugal. Upon returning to the U.S., Amy made a home for herself in beautiful Asheville, North Carolina, teaching students of all ages/levels and performing throughout the community and beyond. Amy won the Principal Second Violinist position with the Asheville Symphony as well as other principal positions in surrounding orchestras. While living in Asheville, she also played/taught with the Opal String Quartet, became an experienced tango violinist and recording studio musician, improvised with many bands and traveled throughout the southeastern United States as a freelance orchestra player. Amy has recently moved to the San Francisco Bay Area, and joined the Alameda String Academy as Resident Teaching Artist in Violin in April 2016.